Bored with the same old photos sitting around the living room table or shelves? Wouldn't it be neat if you could enjoy an ever-changing slide show or range of photos every day? If yes, then this WiFi-enabled, touch-screen picture frame is for you! This frame's 1240 x 800 resolution will enliven your desk, mantel, kitchen or living room tabletop. Perfect for all your family's cherished moments from portrait shots, family vacations, anniversaries, birthdays and graduations. 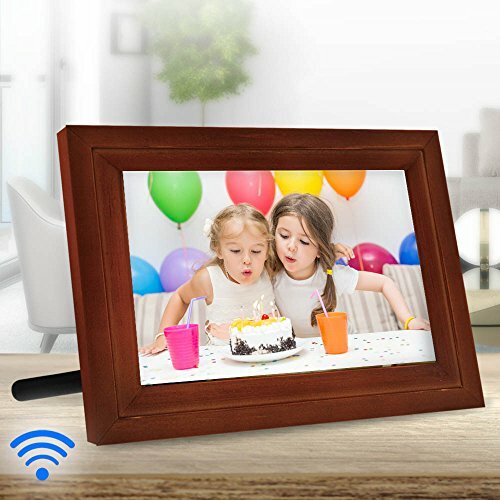 This digital frame connects to WiFi so your family and friends can share the photos from anywhere! You can easily customize and navigate using its touch-screen functions. TWICE AS NICE: The iCozy digital photo display works in portrait or landscape modes. Have it both ways! EASY CONNECTIVITY: Connect this touch screen photo frame with the Wi-Fi and share the photographs from anywhere, using its Free App. If you have any questions about this product by ICOZY, contact us by completing and submitting the form below. If you are looking for a specif part number, please include it with your message.